The services started a 9 AM sharp with a congregational song. The sanctuary was only about 20% full. This church normally has a Swahili language service at 8 AM and a French language service at 10 AM, but the combined the two services for Easter and went from 9-12. 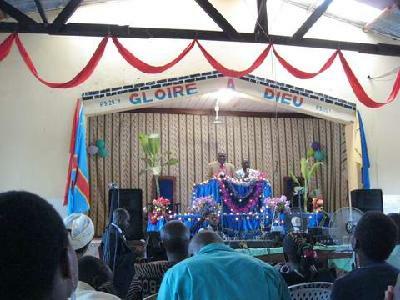 The church was decorated for the occasion and extra chairs had been brought in. The pulpit and pulpit area were decorated with lights, similar to Christmas lights, of various colors in strings which blinked on and off. There is also sound equipment at the front and instruments: a set of drums, two electric guitars and a bass guitar. The guitars mostly play Congolese style – quite loud and high pitched. By this time it is 9:25 and the church is 1/3-full. A ladies choir of about 20 sang in Swahili. I know enough Swahili words to figure out that the words say that Jesus is alive forever. Next is a mixed quartet signing a capela a traditional Easter hymn. Both groups get applause when they finish. Third comes a mixed choir of about 25, about 2/3 women and composed mostly of younger people. They are wearing pink shirts and blouses and dark grey slacks and skirts. They sing with the all the instruments (guitars, base guitar and drums) and use microphones. Normally the choirs would sing on floor in front of the platform, but that is taken up with extra chairs, so they are squeezed in behind the pulpit. 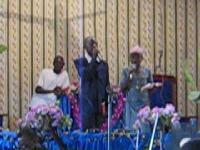 They sing in a style so popular in the Congo and which Congolese have made famous around the world. 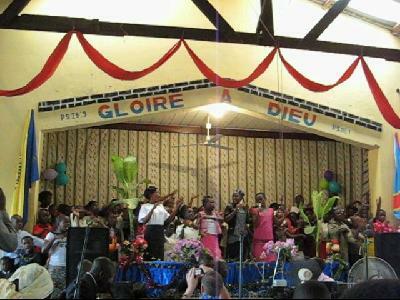 They also sing in the language of much Congolese music – Lingala – with some verses in French. I was a bit surprised by this as Swahili is the lingua franca in Bunia, not Lingala. They sing for about 10 minutes – but only one song. The worship leader exhorts us to continue celebrating Jesus’ victory over the cross. He switches effortlessly between Swahili and French. Now it is 9:40 and the church is over half full. Next is a congregational hymn in Swahili in the style of a Western hymn but with the guitar and drum accompaniment in Congolese style. EVERYONE knows the words. There are no hymnbooks, no song sheets and no projection on the wall. We only sing for about one minute. There are lots of these little “choruses” during the service. The worship leader starts singing, often without announcing that we are going to sing, everyone joins in after the first line and sings with the leader. There is are flags I do not recognize with Scripture on them to one side of the platform and a Congolese flag to the other side. Now a couple men come up to the platform and move the pulpit back. A man announces that the children have prepared special presentations for Easter. The first is the recitation of memory verses. A little boy, no more than five years old, recites a longish section from Isaiah, maybe 10-15 verses. Everyone is stunned. Then follow a series of about 20 children ranging in age from 5 to 13 (a guess) each of which recites a verse or two, occasionally two recite a verse in unison. All of the passages are about Easter in some way. All the verses are in French except one girl, Maziga the daughter of a Congolese colleague who studied in the UK, who recites in English. It is now 9:50 and the church is packed full. Next follows an Easter skit from the children. It is the story of the first Easter. The children act it out while reciting the relevant passages from memory. The ladies go to the tomb, find it empty, speak with the angel, then go back and tell the disciples. Two of them go to the tomb, find it empty, speak to an angel and then go back to the others. Eventually all of the disciples go around telling everyone “He is risen!”. One of the ladies (played by a little girl) is jumping and dancing and running through the congregation announcing the great news. Then the skit continues with Jesus appearing to the disciples. We are then told that the children have prepared a sermon. A young man about 12 in a black suit with a Bible in one hand and a cordless microphone in the other comes on the platform accompanied by a girl about the same age also with a Bible and microphone. The young man starts preaching in French and the girl translates into Swahili. He is telling the story of the empty tomb. The two have all the right intonations and gestures down. The boy is consulting note in his Bible. It is a riot. He says that people around the world worship many Gods, but Jesus is alive. They finish (it is now 10 AM) and get a huge round of applause. Now the children all sing an Easter song in Congolese style accompanied by the guitars and drums. They wave their hands and sing enthusiastically, as though there is not a shy one in the bunch. They get a big round of applause. The man who introduced this segment makes a quick appeal for more Sunday School teachers and the children are gone. The pulpit is moved back into place. Now they introduce visitors. 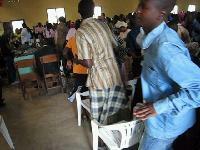 Dayle and I stand up with about 20 others scattered across the congregation. We are told to only say our name and where we are from. We all stay standing until our turn comes, then we sit. Many do not follow the instructions, but add details about the purpose of their trip. Some speak in French and some in Swahili, but no one translates either way. 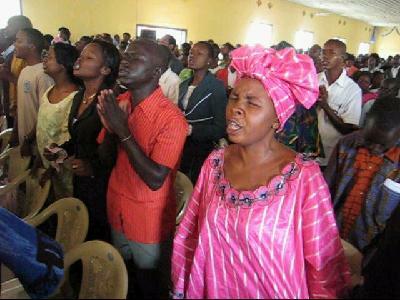 Everyone starts out with halleluiah, hello church, or some such greeting. It is not an exercise for the shy. The guitars and drums are playing light background music throughout the introductions. We are seated near the front, so standing gives me my first good look at the whole sanctuary. It is packed. The benches are crowded. It is wall-to-wall people. Now begins and amazing time of worship. Four flags are brought in from the back of the church during a very lively worship song. Each is a different color and has Bible verses on it. People are swaying to the music, raising their hands. 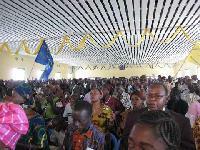 Many are obviously lost in worship and in the meaning of the words –which are in Swahili. 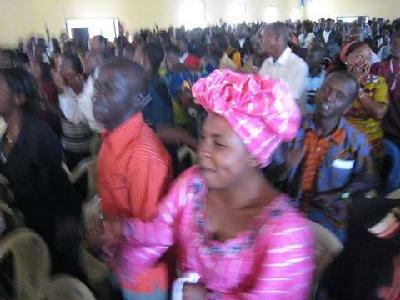 The flags are brought to the front and waved during the worship. At one point the worshipers put their arms over each other’s shoulders and form swaying lines. Then the mood and the music get quieter and more contemplative. People are still swaying to the music, but most have their eyes closed in personal reflection. Some sit and pray with their heads low and in their hands. The songs are being sung as prayers. The intense worship ends at 10:37. Now there are announcements, in both French and Swahili. The most interesting is that the church has letters to send to Aru and other towns, so if anyone is traveling to those places the church would appreciate the travelers would stop by the church office and take the letters. The post office is not yet functional here. In fact in some places it has not functioned since the mid 1980s. The offering is taken. Actually, they make a distinction between tithes and offerings and so they pass two different kinds of containers, one for each. For tithes, it is a cloth bag on the end of a pole that the usher pushes down each row. For offerings, it is a little basket passed down each row. An amazing men’s group (about 10) sings. Their style is like Southern Gospel and they sing a cappela in Swahili. One of their songs has parts going in an out and up and down a bit like a madrigal. It was awesome. Now comes the sermon. It is on the story of the road to Emmaus. The meaning of the resurrection was not evident to the disciples, and it is not readily evident to us. The power of the risen Lord can only be effective in our lives as we hear and put into practice what Jesus said. The pastor quotes many verses of Scripture without turning to them in his Bible. At one point he asked the congregation about certain verses and most of the congregation quoted them back to him in Swahili or in French. The preacher prays to close the sermon at 11:47. He gives and opportunity to people to come to the risen Christ or come back to him by raising hands or standing up. At 11:53 the congregation sings a song in Swahili. There are a couple quick announcements including that there are counselors available for those who raised their hands or stood. 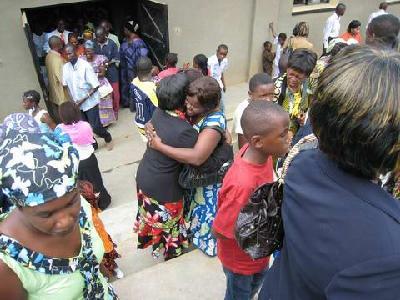 The Pastor and Elders are dispatched to the various doors to greet people on the way out. Then the choirs go out and then the rest of us, row by row starting from the front (out the side doors) and the middle (out the back doors). While this is happening the younger choir sings a song in Lingala. It is now 11:59. We were done by noon! This entry was posted in Christianity, Faith now, Religion and tagged Bunia, church, Easter. Bookmark the permalink.